An example of tropo induced by a heatwave. Wondering what weather conditions are required to enable a 250 watt station to duct 1,477 km over the Tasman Sea? Let's try to find out what was happening on November 28th, 2009. In the far northwestern, southern & western NSW, respectively, temperatures of 37.9 degrees were reached. The temperature reached 37.5 degrees at Goondiwindi (Eastern Darling Downs). The temperature reached 37 degrees at Gatton (near Brisbane). The temperature reached 36.8 degrees at Thangool (south coast of QLD). In western NSW, a temperature of 42 degrees was reached. The temperature reached 39 degrees at Baralaba (south coast of QLD). The temperature reached 38.2 degrees (highest for the month) at Toolara (near Brisbane). The temperature reached 32.9 degrees (highest for the month) at Double Island Point Lighthouse (near Brisbane). In NSW, this was the hottest November ever recorded, in terms of both average minimum & average maximum temperatures. In many southern Queensland locations, this was also the case, in terms of average maximum temperatures. By November 20th, there were 100 bushfires in existence across NSW. It is the view of the NSW Climate Services Centre that these crazy temperatures were likely caused by the presence of El Niño in the equatorial Pacific Ocean. Above: Conditions just hours before the reception. There is a high pressure system located in the Tasman Sea between New Caledonia and Northern New Zealand. This high had been 'sitting there' doing very little since November 25th. 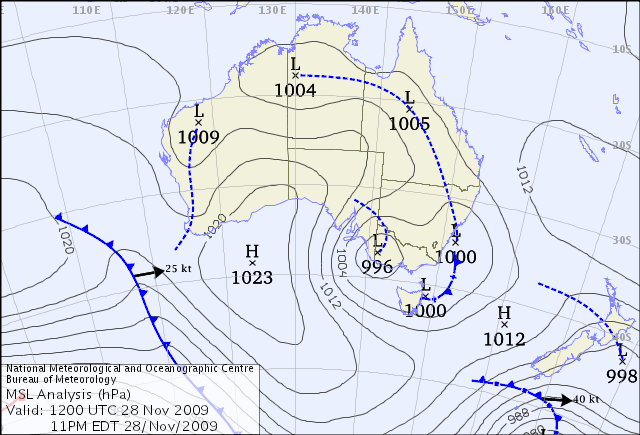 Note also the trough of low pressure across southern Queensland. Above: Conditions at the approximate peak of the reception. Early Morning of November 28th, 2009. Note that the high is still there. These near-stationary highs were also the likely cause of the extreme temperatures. Above: The latest updated Hepburn chart for the approximate time of the reception. Note the orange around the NSW North Coast. Left & Below: A full day after originally hearing the reception, I went for a late night drive up to Clear Mountain - with an elevation of 247 metres - just in case. To my surprise, Norfolk was still clearly audible. Upon returning home, Norfolk was not audible using my antenna. Note the blood red around the NSW North Coast. Norfolk Island FM was also received on the evening of August 24th, 2009. In the interests of brevity, that reception is not detailed on this website. Nonetheless, here is a brief analysis of the conditions I experienced at that time, in the hope that patterns can be found. 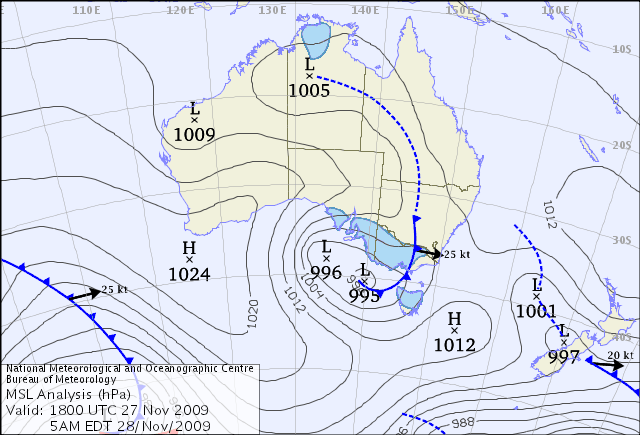 Above: Firstly, we view the synoptic chart for the morning before. Note again a big 'juicy' high stretching from New Caledonia to Northern New Zealand! Note again a large cold front (shown as barbed lines) moving eastwards. Secondly, we view conditions just hours before the reception occurred. Right: The synoptic chart at the approximate time of the reception. Evening of August 24th, 2009. I must admit this was the first time I have experienced this sort of tropo from around 5:30pm. It pays to listen to your radio even at these unusually early evening periods. Experienced enthusiasts generally seem in agreement that the best times to catch tropo are between 7pm and 11am, which I find easy to remember as the 7-11 window. Typically tropo peaks at the most inconvenient times, when you really wish to be in deep sleep! This instance served as a good reminder to me that there are always exceptions. I would argue that, as we get more experienced, the only thing we know for sure about propagation is just how much we don't know! Just like life, except possibly a little more predictable! The opinions expressed are my own, unless otherwise noted. My commentary should not be construed as anything other than a lay person's observations. If you find this interesting, you might like to check out the Bureau's page which helps explain how to interpret synoptic charts. 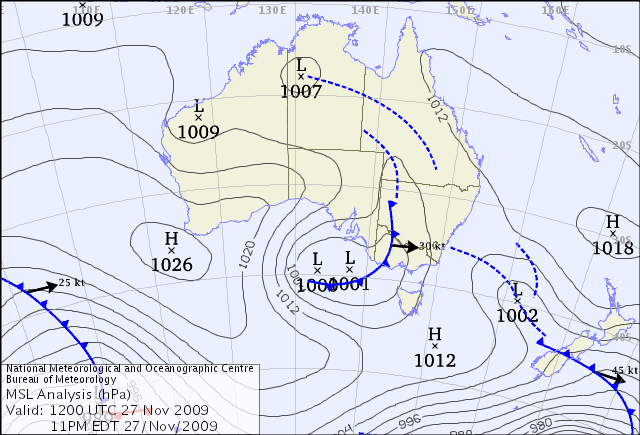 Synoptic charts are provided courtesy of the Bureau of Meteorology under the Fair Use (research) provisions of the Copyright Act. Copyright 2009 The National Meteorological & Oceanographic Centre, a division of the Bureau of Meteorology. Hepburn Tropo charts are provided courtesy of legendary DXer & meterologist William Hepburn. Copyright 2009 William Hepburn. The copyright owners retain exclusive rights to their works. 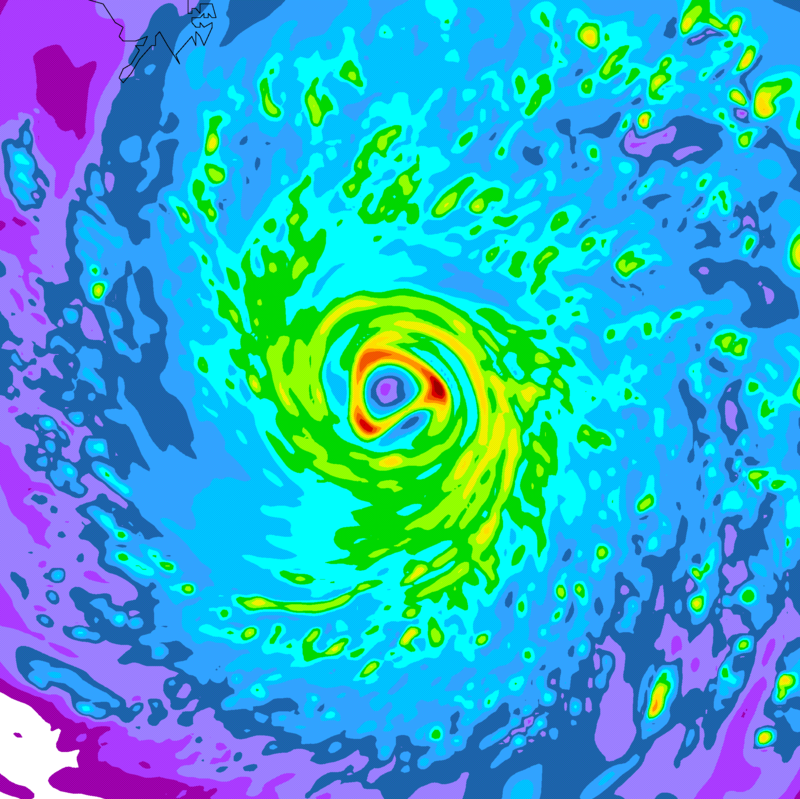 Detailed weather data can be found in the Bureau of Meteorology's Monthly Weather Review archives. Temperature data provided by the Queensland & NSW Climate Services centres have been used to compile this report. These centres are divisions of the Bureau.